Blog home > In the field > Fresh or fodder? On a recent photo tour I overheard my co-guide Mark Hamblin being asked about his favourite image. Mark replied that he tended towards images he’d recently taken, implying that ‘freshness’ equated to enduring ‘quality’. It’s inevitable that when photographers, even established pros like Mark, acquire new images, especially from a place that they’ve never before photographed, there is an emotional attachment to those images: we can still sense being there, we can re-live the moment through the image. Moreover, if the images were hard won, perhaps through hours of waiting or days of travelling or even thousands of pounds of expenditure, we are easily tricked into imagining those images are at least compelling, if not ground-breaking. But of course our audience is dispassionate, cynical even. For them, the image is what it is, irrespective of the back story. Do I really like this recent abstract of swirling knot or am I influenced by the distance I travelled to secure it? There’s a bit of the trophy hunter in all photographers and there’s nothing better than showing off a newly-acquired, brand new shiny trophy. But in an age of excruciating competition I’ve noticed a trend of late, a trend that I’m part of, but one which does nothing to relieve the ubiquity of wildlife imagery. Social media in all its myriad platforms allows us to shout from the rooftops about our new trophies, but are our trophies really as impressive as we think? Are we mistaking image freshness for image quality? And are we falling into an even more self-destructive trap – that of bludgeoning our audience with quantity rather than quality? In some cases, I think that is the case and it’s becoming ever-more difficult to ‘surprise’ the viewer. This red squirrel shot has been around a few years and I still like it: it’s stood the test of time. I’ve recently completed my second ebook and although an emotional attachment to the images was in fact, an integral part of the narrative, I nevertheless found it very difficult to objectively judge whether an individual image ‘worked’ or whether I just felt it worked. I adopted the most trustworthy barometer that I could think of. If I was considering a recent image, I asked for a colleague’s opinion as I didn’t want ‘freshness’ to blinker my objectivity; for older images I was more confident, as if they’d endured the passage of time, if they were still amongst my favourites after months or even years, then they must have appeal beyond just being ‘new’. I’ve had a bit of a rethink of late. I have now adopted a simple approach to avoid confusing freshness with fodder: Take the image and wait 6 months before processing it, longer if possible. Without the immediacy of the experience screaming in your head, you can judge your images objectively. My guess is that far fewer will get past the editing knife and fewer still will find their way onto Facebook! This landscape from Iceland is around 4 months old – not mature enough yet to warrant an objective evaluation. Bravo, Pete – for saying things that many of us are thinking. I agree, there’s the tendency to “live in the moment” with “blinders on” and shout “heylookatwhatigot” from (insert cool place here)! I’m going to try and follow your advice, and give images a rest before processing… we’ll see if I’m successful! Really interesting blog once again. I think this is a different predicament for us amateur/part-time photographers who don’t do it as a profession. Most of us wait all week to get out with the camera over the weekend, some weekends we don’t get anything decent and then have to wait another week to try again (especially in winter, spring/summer can be a bit different as we can go out after work). The problem with this is that once we finally do get a decent shot then we have a whole week to do nothing but edit it and then naturally you want to tell the world! We don’t really have a year’s/6 months worth of unedited images that we can dip into so all we want to do is edit what we have recently taken and then anticipate the next chance we we will get! I’d love to have images from months ago, gems sitting on my hard drive waiting to be unveiled but unfortunately I am just not that strict with myself and as a part timer just want to keep my name and my images out there. Saying that I think there is definitely something to take from all this, keeping images back and waiting to edit them can not only help with the issues you have mentioned but it can also mean that if they get into competitions they have never been seen before or just give you time to work on a collection to unveil rather than singular images. I will start thinking more about how and get my images out there in the future for sure. A thought provoking question Pete. As others have mentioned, being an enthusiastic amateur relieves me of the burden of having to produce images that are marketable and eye-catching, although it doesn’t stop me trying and enjoying the challenge in the process. As with all artistic fields “beauty is in the eye of the beholder” and some images I’ve been really pleased with and posted on ‘facebook’ etc. have met with deafening silence while others that I would only classify as nice record shots have met with far more appreciation and comments than I felt they deserved. I think we are all influenced by the circumstances and the moment in which we capture the image but I’ve also returned to archive shots only to decide at a later date that they were far better than I thought on first viewing. Is there such a thing as a universally good picture? 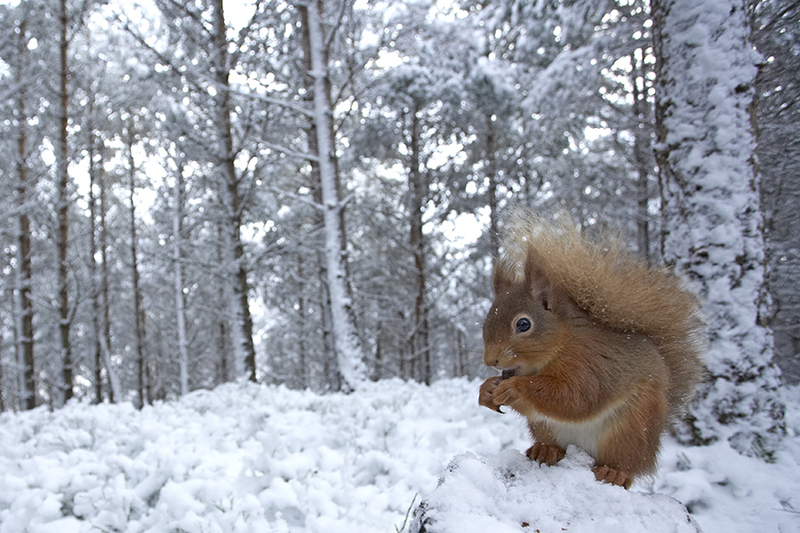 I suspect not but there will be some pictures that the majority find pleasing – your red squirrel in snow for example. Personally I like your swirling knot but I’m less of a fan of slow shutter speed milky rivers and streams, but couldn’t give you a rational reason why. Just as well that we all have different preferences or life would be very boring. On the other hand my wife Judy has just said she’d love your “swirling knot” on our wall – in place of one of my efforts! Opinions can change – rapidly. I wondered when a swirling knot image would appear, Pete? Seems like less than two weeks ago when we were in the now defunct Roost Hide at Snettisham, mere hours before the storm hit. Oh, and I promise I will not mention to anyone who it was who got lost 200m from the hide after driving all the way down from Scotland. Leg pulling over, the problem we grumbled about early that morning is the lack, or perceived lack of, for want of a better word, “soul” in images. Recently I was chatting to a mutual friend about the same subject when he showed me an old(ish) image I had previously not seen of a Wolverine in a forest. The image was taken under difficult light and weather conditions on film. The Wolverine had been photographed relatively small in the bottom right of the frame in its woodland habitat. Whilst far from perfect by modern standards, the image evoked a far greater emotional response and has stayed in my mind more than any of the modern images of Wolverines that are routinely posted on Facebook etc. In one of the articles reproduced in his book an “Inner Game of Outdoor Photography”, Galen Rowell recounts the story of a professional musician who desired to make the first perfect recording of an incredibly difficult to play score of music. The musician could only achieve this by breaking the score down into individual parts which were then perfected and recorded separately. When the complete score was assembled and played, whilst it was perfect, it lacked the emotional feeling of other recordings of the same score that, whilst far from perfect, provoked far greater emotional responses. It may seem counter intuitive to suggest that “perfection” is the root cause of the problem but will an image that is “perfect” but nonetheless fails to provoke any meaningful emotional response last the test of time? The images of the Omaha beach landings made by Robert Cappa are far from perfect but are they not amongst the most powerful images made? Perhaps the desire to achieve perfection, at least in a technical sense, should be secondary to the desire to produce images that have a far greater sense of feeling and that provoke a longer lasting emotional response? After a bit of a lay off from processing old and taking new images the advantages of leaving it for a while resonates strongly. Having recently picked up from where I left off, the lack of ’emotional’ attachment to the images on my hard-drives makes for much faster editing sessions and considerably high productivity. The merits of delivering a handful of high quality images apposed to a dustin bin full of mediocrity is well documented – I believe the ‘waiting game’ contributes to discernment and ultimately a better body of work. The same approach should be applied to the older images in ones library too; at the very least the process may indicate the photographer’s progression in the art of picture taking. An interesting thread this one. I went to Iceland in Summer 2008 and took a lot of shots. I processed them almost immediately on my return. I was somewhat disappointed with them as I felt I hadn’t captured the “power” of the images that were fresh in my mind. Of all the pictures I took I felt only about half a dozen made the grade. I process my pictures using Capture One Pro and several months ago in one of their emails they suggested processing older raw files with their latest software. I did this with my Iceland raw files from 2008. I hadn’t looked at them for a few years and when I sat down and began to work with them I really did look at them as if I had never seen them before and to my surprise and delight they were much better than I remembered. Furthermore, with the added “pop” from the latest software, I suddenly found myself with far more keepers than I ever thought I would have had from the original processing five years or so earlier. So it appears to me that the passage of time removes us from the emotion of the pictures and gives us the objectivity needed to see the pictures as they really are. It was almost like looking at someone else’s work and this was something I found very refreshing.